I tried to start some cucumbers from seed indoors, and am only left with 3 plnats that survived. The plants all have very "leggy" stems, and some are damaged slightly, but they have grown their 3rd set of leaves, just on a very long stem. My question is: will they survive with a stem like this? They seem to be growing, but are very fragile. They look like they just need some sunshine now. Your pictures are fine ! I would plant them very carefully and keep them moist in some good sunlight. Maybe not strong sun though, to start. 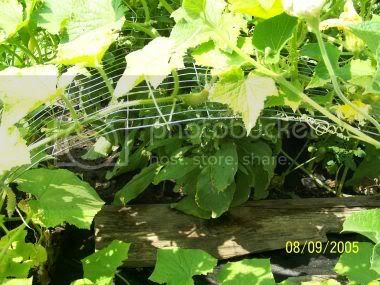 There are other posts about cucumbers and that they do best planted directly in the soil. I planted mine in seed trays too though. im not sure wether they will? going by the size of the leaves they should only be about 2 inches tall. it looks as though they dont get enough light, and maybe too much heat! if you have any seeds left, i would re sow. but this time once they have sprouted remove from the heat and give them as much light as possible. there's plenty of time for cucs so no need to panic!! 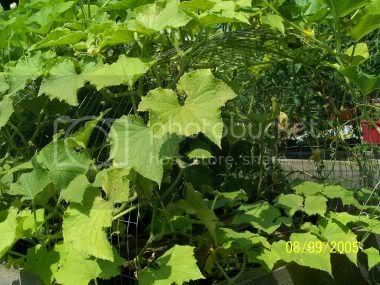 The easiest way to grow cucumbers is to sow them in the ground directly...they really do not like to be transplanted, So if it was me, I wouldn't waste the seed starting over indoors. I would just sow them directly outdoors where ever you want them to grow (It needs to be above 40 degrees night time temperature outside)...be sure to keep them mosit daily until they sprout. They are best seeded directly in the garden. Most cucurbits are, i.e. 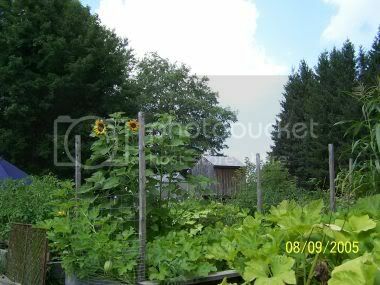 squash, cukes, melons, pumpkins. Thanks! I stuck em in the ground and re-seeded, we'll see what happens. Good Luck Claire, Let us know how you do with the direct seedling. Just make sure to look out for late frost. They are not at all hardy and will need to be protected. Good luck. Cap them with a cut off clear/see thru plastic juice bottel, cut it off, almost right at the bottom, that will give you the whole length of the juice bottle for the heigth of your plant.. Thanks! It was 85 here today and our nightly temps are supposed to stay in the high 50's-low 60's, so hopefully they'll do ok. They look good so far....and so do my squash, which I transplanted as well. Thanks for the bottle tip Weezie - what a great idea! Is that only for frost protection? I also had another question about cuc's - is it better to grow them up as a vine, or let them spread out on the ground? I have read/heard both. And early planting if you are still experiencing cold temps at night time.. I did them up a rabbit fencing thing and had great luck with them..
Also did an experiment with them and made a half moon shape and tucked on end in the dirt and the other end, then they grew up there, and planted stuff like a lettuce under it, for some dappled shade..
and the cukes' grew up those..
For me, I grow them up the fencing because of limited space, I have 5 raised beds, and space is tight for the amount of what I plant.. I like them better up the fence, then there's not much dirt of them.. I prefer to grow mine on a fence or cage, I like the idea of keeping them off the ground. I normally grow mine on the ground, but this year I am growing them on fence wire, On the ground you have to bend over and dig around in those itchy leaves to find your cukes, growing them up on something no more bending over and digging around in those itchy leaves, and hoping not to see some critter under those leaves when on the ground like a snake.